AWS, NVIDIA, Stanford, EPFL, and UC Berkeley have joined forces to tackle clinical problems in biomechanics. The NIPS 2017 Learning to Run challenge brings together over 300 researchers, engineers, and enthusiasts from around the world to apply deep learning to medical research. The challenge will culminate at the international AI conference Neural Information Processing Systems (NIPS) 2017 in Long Beach, CA. 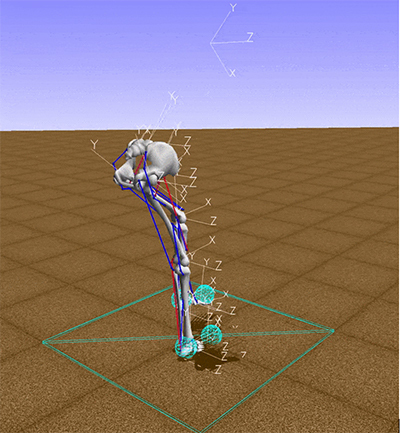 Through this collaboration, an open source environment was built to simulate adaptation of human motor control for new biomechanical settings. Algorithms solving this problem can be used for modeling how we respond to musculoskeletal surgeries for different kinds of prosthetics and exoskeletons. With recent advancements in deep learning and deep reinforcement learning, and great successes in applying it to gaming and autonomous driving, researchers are investigating what role these methods can play in medical research. To spur participation in the challenge, AWS has offered $30,000 (USD) in cloud credits and $300 (USD) each to 100 top performing participants. Plus, you still have a chance to compete for an NVIDIA DGX Station! Prediction of surgical outcomes has always been a great challenge in medicine. In the age of big data this problem can finally be approached with quantitative methods. However, looking at large datasets of patients (their history and responses), tuning the parameters of surgeries, or experimenting with new ideas is difficult in practice and unethical. Simulations provide a potential alternative to real surgeries. Software that is already available and widely adopted, such as OpenSim, greatly simplifies decision making. Practitioners can use the software to understand which muscles or bone deformities affect gait pathologies in individual cases. This helps doctors to tune surgery parameters and systematically improve outcomes. While simulations can help in very specific and simple cases, they don’t allow us to predict the outcome holistically, since this would require understanding how the human brain adapts to the outcome of the surgery. However, with recent advancements in artificial intelligence, we can finally approach this problem. Using deep learning we can tell if a mark on the skin is skin cancer as well as a doctor can. Deep learning can detect breast cancer earlier than ever, and can better understand gene expression data. These and many other results motivate further exploration of deep learning methods in healthcare. Most of the approaches are based on a similar principle: collect the data, ask experts to annotate the data, and try to imitate these annotations using machine learning algorithms. Although this approach works great in practice, its human-centric design only allows us to reach human accuracy. To go beyond these frameworks, we need to employ stochastic perturbations in the space of possible solutions. This insight allowed researchers from DeepMind to beat the champion of Go. Through our NIPS challenge, we want to understand if the same approach can help us predict outcomes of a treatment better than a doctor could. Control of the human body is a very complex and sophisticated process due to the complexity of our muscles, nonlinear actuation, noise in the neural signals and many other problems. Participants of the challenge have been struggling with the problem of control, and many of them have already succeeded in making the biomechanical model run at around 3m per second! While the results are not yet directly applicable in medical practice, we can clearly see that the approach can be useful in the near future. With two more months to go, we are confident that our crowd-sourced research will lead to great innovation in biomechanics. Check out the top solution so far from Jgeek. He trained a controller that can not only pass the obstacles, but also synthesize movement close to a slow human run. Visit the leaderboard to see how the competition is shaping up. Have an idea for how you could use deep learning to tackle problems in medical research? There’s still time, so enter the NIPS 2017 Learning to Run challenge for your chance to get free AWS credits, win an NVIDIADGX Station and put deep learning to the test.